Just after midnight on July 11, 1943 a U. S. Air Force bomber rumbled on to the flight line for takeoff from the Allied controlled field at Port Moresby, New Guinea. Capt. Ralph Deloach carefully eyed his instrument panel as the #2 engine sputtered and coughed before settling into a smooth synchronicity with the other three powerful propellers breaking the torpid tropical night’s lassitude. Deloach eased his throttles a bit and swung into the wind waiting for the aircraft in front off him to clear the runway. The veteran pilot was in command of one of WW II’s most famous bombers in the South West Pacific theatre of operations. This was a B-17 four-engine workhorse, dubbed the Flying Fortress, that had made history from Europe to the Pacific as the U. S. primary airborne attack weapon in the war against the German and Japanese forces. Deloach was aboard the infamous Black Jack, a veteran of scores of bombing missions. Tonight’s raid had him bound for New Britain Island to attack the heavily fortified Japanese airstrip at Rabaul on its northeast tip. They would also engage an enemy convoy with over 7000 troops aboard bound for Lae. From Port Moresby, the flight would be nearly 500 miles over mountain ranges topping 12,000 feet in height and then traveling blacked-out over open ocean before turning north to his target. He quickly reviewed the course with his co-pilot Lt. Joe Moore who sat in the right seat opposite him. Moore was engaged in a quick run-through of the final checklist and grunted his confirmation of the outbound course to steer after takeoff. They would climb out to the west over the Gulf of Papua to gain altitude before scaling the mountain range that bisected the southeast peninsula that stretched down to Milne Bay and oblivion. The moonless night was clear but he hoped the darkness would cloak their approach from the sea before the Japanese army could detect their presence. A full load of munitions rested in the bomb bays. Their release over Rabaul would light things up pretty well in a few hours. Deloach’s radio crackled in his headset and the clearance was given to takeoff. He firmly pushed the four throttles forward and the plane responded, sluggishly at first, then with increasing speed. Passing 100 knots, he dropped a few degrees of flaps from the wings and raised the nose. Black Jack lifted off into the night sky and disappeared over the water climbing rapidly. Deloach reduced the throttles at altitude and settled in for the flight. Even though he was nine degrees below the equator in the tropical latitudes, above 12,000 feet it was cold and he shivered lightly in his flight jacket. He reached for the cup of coffee he’d carried into the cockpit and sipped it gratefully as the plane leveled off and Moore took over to hold her on the northeast course. Deloach had time to reflect on his aircraft’s war record and his predecessor that flew her to glory, the legendary pilot Capt. Ken McCullar. It was McCullar who had established Black Jack’s reputation and flew her into the history books. But McCullar was dead now, killed in a fiery takeoff crash in another plane and Deloach commanded the B-17 this night. At that moment, he had no way of knowing that this flight would be the last mission of Black Jack. The B-17 Flying Fortress was a big bomber by any conventional measure, weighing in at over 20 tons. Four 1200-horsepower engines hung from her wings that spanned 103 feet in breadth. In fact, the wingspan exceeded the 74-ft. length of the aircraft by a considerable amount. Thirteen machine guns jutted from her turrets and gun ports along with a full complement of bombs. Her crew of ten typically was made up of a pilot, co-pilot, navigator, bombardier, flight engineer, radio operator, two waist gunners, a ball turret gunner, and an extra gunner who roamed within the fuselage as needed. B-17s became famous through the exploits of their heroic crews over Europe in such aircraft as the Memphis Belle, later immortalized in press and movies. Black Jack was B-17 #41-24521, Model E. She rolled out of Boeing’s Seattle factory in July of 1942 and six weeks later was assigned to the 43rd Bomb Group based in northern Australia. The 43rd was part of the 5th Air Force that had been specifically formed to provide aerial support for General Douglas MacArthur’s return to the Philippines. This was considered crucial to the defeat of the Japanese Empire’s forces in the western Pacific. But in September of 1942 the Japanese were within 30 miles of Port Moresby, the last major Allied position in New Guinea. This was the stepping-stone the Japanese hoped to use to invade Australia, only a short distance to the southwest. The 5th Air Force was engaged in a desperate holding action facing an overwhelming enemy force. The new bomber was assigned to McCullar and was given a new nickname, Black Jack, derived from the last two digits in her serial number “21”. Her name along with an artist’s rendering of the Jack of Diamonds and the Ace of Spades was painted on her starboard nose proudly declaring her identity. It was one that the Japanese would get to know all too well over the next nine months. There was a bond between the aircraft and her skipper that was palpable to her crew and other observers. McCullar enjoyed a reputation as a flamboyant gambler and fearlessly aggressive pilot. He even had a 14th machine gun mount installed in the plane’s nose fired by a button on his control wheel so he could use the big bomber to personally duel with Japanese fighters that dared to challenge him. He pioneered a tactic called “skip bombing” where he would roar in at minimum altitude and release his bomb loads about a hundred feet short of the target ships. The bombs literally skipped off the water at high speed and slammed into their prey just at the waterline. It was highly dangerous, requiring split second timing, but devastatingly effective. McCullar’s technique was picked up by the rest of the 43rd and sent thousands of tons of enemy ships to a watery grave. Black Jack and McCullar became an awesome team, simultaneously respected throughout the Allied squadrons and feared by the Japanese. Flying as many as three missions a day, Black Jack and McCullar achieved near mythic status and always came back… sometimes against all odds. In November of 1942 the Japanese decided to mount a troop deployment on the Allies and sent five destroyers laden with attack forces out of Rabaul into the Huon Gulf under cover of night. This would stage an assault on the undermanned Port Moresby less than 75 miles away on the other side of the peninsula. The B-17s were sent to stop them. McCullar led the air group and located the destroyer convoy as they cleared Rabaul and headed west under New Britain Island. His first attack run was made at less than 200 feet skimming in over the ocean as tracer bullets from the ships outlined his approach. His bombs just missed the first destroyer and he decided to go around for a second bombing run. Enemy machine guns had set off ammunition stored in Black Jack’s tail section and a fire broke out. Flames leaped out into the interior, but the crew managed to control it as McCullar lined up his second attack approach, this time barely above the wave tops. McCullar waited until the enemy ship filled his entire view and then dropped his bomb load with a direct hit on the bow section. Rocked by machine gun fire and heavy artillery, Black Jack sustained several hits that wounded three crew members before they veered away barely escaping. The cool McCullar fought for control and swung the aircraft back around for a third attack run. This time the Japanese fleet put up a blistering wall of fire but more of Black Jack’s bombs found a target with another ship. A geyser of explosions filled the night sky and the plane’s left outboard engine was hit and the controls were shot away. Though crippled and fighting to keep his B-17 in the air, the unflappable McCullar made a fourth low level attack run scoring more hits on the remaining Japanese warships. With two bombs left, a final fifth pass was made from 4000 feet. That cost him the inboard engine on the right wing that was hit in the fuel system and shut down. Now down to only two engines, Black Jack began to lose altitude and McCullar faced the long haul back to Port Moresby that would require him to somehow clear the Owen Stanley mountains… over two miles high. It was a grim scenario: only two engines working, a third on fire, the aircraft shot to hell, half the crew wounded, and unable to maintain altitude. A quick glance at the altimeter confirmed the worst… they had slipped below 3000 feet. McCullar ordered the crew to throw out all remaining ammunition and loose equipment in a desperate attempt to slow their descent. The damaged left engine smoldered and sparked threatening to explode at any moment. Ditching in the ocean seemed the only way out but would mean certain capture by the Japanese and McCullar doubted if his wounded could make it out alive on the crash landing. The command came to rip out seats, tables, emergency gear, even their machine guns, and throw it from the amidships hole in the fuselage. Slowly Black Jack leveled off and began to climb on her two remaining engines. The left outboard propeller glowed cherry red and finally sheered off spiraling into the sea. It took two and a half hours to wrench their way to 10,000 feet, just enough to make it through a mountain pass and set down safely in Port Moresby. McCullar’s gritty persistence brought his crew back safely and his unprecedented five attack runs sank the Japanese destroyer Hayashio. Tonight’s mission had already started badly when the #2 engine failed to run smoothly during takeoff run-ups. Deloach snapped to attention when the right inboard engine faltered two hours into the flight. He adjusted the fuel mixture and it finally stabilized. Engine troubles and he wasn’t even over the target yet? Was that an omen? To add further stress, a violent weather system could be seen approaching as they neared the southeast coast of New Britain. Now flying in violent winds, driving rain, and flashes of lightning Deloach fought to keep his plane aloft. He finally caught sight of the enemy convoy and lined up his bombing run. The squadron of B-17s roared in from the storm and caught the ships by surprise. The enemy was almost completely annihilated, less than 900 of 7000 Japanese combatants survived. Victory was fleeting however. As Deloach maneuvered for his return to Port Moresby, the full fury of the storm erupted on Black Jack. Rocked by turbulence and with visibility so reduced that the other planes were obscured, a battle ensued just to remain in the air. First one, then the second engine on the right wing failed. Dodging the dense main storm clouds and pockets of lightning, Deloach was blown off course and finally became hopelessly lost. With fuel low and the plane struggling to maintain altitude, the pilot knew they would never clear the mountain range even if they could establish their position. Shouting to Moore as a sounding board for options, the two men grimly decided that ditching was their only choice. In the early dawn light they peered below them looking for a potential site to put down in shallow water. Sweeping over a finger of land known as Cape Vogel, Deloach caught a glimpse of a native village perched on a sandy beach next to a shallow lagoon. He quickly relayed his intentions to the crew and told them to secure for a crash sea landing. With two engines out and fuel down to fumes, Deloach lined up his approach. He knew he’d only get one shot at it and better make it good. Cranking in full flaps, he brought the plane in nose-high and as slow as possible. It touched down briefly inside the lagoon and skipped into the air again to land just outside the barrier reef in deep water. Three crewmembers were injured on impact, but all nine scrambled out of the sinking hulk and fell into the black water as the morning sun rose from the storm-tossed ocean. But fortune smiled on Deloach and his men as the natives saw the plane crash and launched their canoes to rescue them. All were safely recovered and they spent the night sheltered from roaming enemy troops in Boga Boga village. Their escape was facilitated the next day by an Australian coast watcher named Eric Foster who called for a small seaplane to set down and take out the three wounded men. Later a P.T. boat came in and rescued the remaining crew dropping them off on nearby Goodenough Island. Another small plane landed there and brought them back to Port Moresby, a fitting end for a courageous crew and a legendary B-17. Deloach was awarded the Silver Star for his flying skills and valor saving his men. He later embarked on another career as the “Marlboro Man” in a series of ad campaigns that celebrated his craggy good looks as a symbol of American rugged individualism. 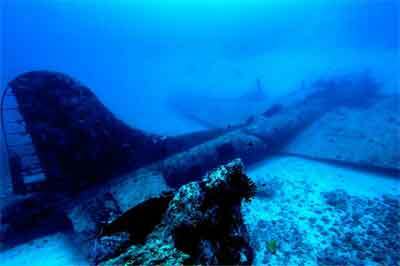 I had the chance to dive the Black Jack in November of 2004 while aboard Mike Ball’s Paradise Sport out of Milne Bay. We anchored just inside the barrier reef allowing easy access to the drop off wall face. My wife Gretchen and Capt. Larry O’Driscoll would accompany me. First we secured two nitrox cylinders for decompression to a stage line off the anchor rode. A steep wall precipitously fell away from the shallow reef top and we glided down to about 75 feet where we picked up the first glimpse of the massive tail of the wreck looming up from the sand bottom at about 150 feet. As we descend, a strong current makes itself known and it’s necessary to kick vigorously to overcome it. We approach the wreck from the tail that towers nearly thirty feet above the main aircraft frame. The tail machine gun turret is clearly visible and I indicate that Larry should take up a position nearby and illuminate it up with his dive light. I gesture for Gretchen to take a high position on the tail to add more size perspective. This is the hardest assignment since she has to constantly fin into the streaming current. We shoot a few frames aft and begin making our way along the fuselage. The Black Jack is in almost unbelievably good condition after over 60 years submerged. The aluminum structure is largely completely intact and only sparsely covered with a bit of marine growth here and there. Incredibly, the ammunition belts remain fed into the 50 caliber machine guns and their barrels still rotate freely. The right tail section horizontal stabilizer is bent slightly upwards from the impact of settling in next to the drop off wall. Swimming forward we can easily see into the fuselage compartment where the crew had braced for the landing. The cockpit is intact as well and I can reach in to move the pilot’s controls. Both seats are in place, pushed all the way back to allow Deloach and Moore to escape from the overhead hatch after setting down. The nose has bit of an upward bend to it from the initial impact and all four propellers are in still on their mounts to the massive engines. The blades show evidence of crumpling and bending from their first contact with the ocean surface at nearly 90 knots. The entire forward section of the wreck is swarming with bait fish schools, snapper and adorned with some layers of bright soft corals. Attracted by our intrusion, a few sharks sweep into view to check us out. Eighteen minutes into the dive we are well into decompression obligations and I signal Gretchen to precede us on the ascent. I watch her and Larry drift with the current back to the tail and follow the ascent line up the wall. Alone on the wreck now, I fight my way back into position to shoot some wide shots of the wings and nose-to-tail perspectives. The current increases slightly and I angle to intercept the ascent guideline. Checking my air supply, I note that I have nearly 1000 psi remaining and decide to indulge a few more minutes to capture the entire B-17 lying placidly on the seabed. It looks like Black Jack could have landed last week… not six decades ago. Firing off a few more frames, I drift up towards the deco tanks and rendezvous with my partners. We surface 30 minutes later into a blazing sunny morning and ease our way back to the stern of Paradise Sport. As we toss down breakfast, Larry asks if we’d like to visit Boga Boga village and we eagerly accept the invitation. The natives of the village swarm around our launch as we come ashore. Other divers from the liveaboard have preceded us ashore while we were diving and we find that the entire village has turned out on the rare occasion that outside visitors appear. We’re struck by the absolute cleanliness and orderly appearance of the village. This is in rather stark contrast to many of the primitive settlements around Milne Bay near Alotau. Each thatched hut has a manicured garden and freshly swept sand yard. The inhabitants have mustered an impromptu craft fair and dozens of wares are displayed on brightly colored fabrics. It’s a good thing that most of this activity is taking place under the shade of the palm trees because the temperature in the sun is “off the scale” hot. Two guests blister their feet trying to walk barefoot from the launch landing site to the village. I adopt a modified sprint from one shady spot to another and arrive unscathed, but panting, in the equatorial heat. What made me think I wouldn’t need at least a pair of sandals? I feel like an astronaut that landed on the sun’s surface. I’m fortunate to be introduced to one of the village elders who was a small boy when Black Jack swooped over and splashed into their lagoon. 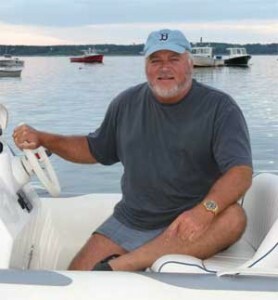 His father was one of the first to paddle out and haul the floating crew to safety. He tells me that Capt. Deloach returned to Boga Boga after 45 years had past to see again the place of his narrow escape. I tell him that I had seen a video that chronicled Deloach’s visit. The concept of “video” is not one he’s familiar with and I snap back to his reality where no electricity exists and only a handful of mechanized equipment is to be found. This is mostly limited to a few outboard motors that are rarely used due to the logistics of obtaining gasoline supplies from hundreds of miles away. This is still an outpost only barely removed from the Bronze Age and cook fires burn lowly as the evening meal simmers with a fragrant aroma. After dusk, candles and lanterns provide the only lights and they are extinguished a few hours after sunset as the villagers retire en masse. It’s a simple life of modest gardening, fishing, and tending a few goats and pigs. A one-room school dominates the north end of the village bringing education and literacy slowly to the newest generation. Gretchen amazes the children who follow her by taking their photos with her digital camera and instantly displaying them to her fascinated audience. For many, it’s the first time they’ve ever seen themselves this way and a chorus of delighted giggles arise with each display. They follow her like the Pied Piper and each new image she shows them brings new shrieks of astonishment. The villagers saved Deloach and his crew in 1943 in spite of the very real threat of reprisals from the Japanese. And now the wreck of the Black Jack has spawned an unforeseen economic benefit. 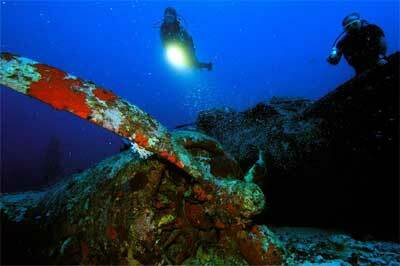 Divers come to explore the airplane wreck and the village visit is an added bonus. Paradise Sport used to visit about 9-10 times a year and her guests brought an infusion of cash as they purchased weavings, shells, wood carvings and other unique crafts that are laid out for inspection. Now Mike Ball has departed and relocated the vessel to Australia. So only a rare chance for visits more occur if a liveaboard detours from another itinerary on request but don’t count on it. Our group spends a several hours ashore in the warmth of the sun and the village’s hospitality. Finally, we bid our farewells and clamber back aboard the launches to ferry us out to the vessel. With the sun well overhead, I peer over the drop off as we approach Paradise Sport wondering if I can make out the wreck far below. The cobalt blue water rewards me with a clear distant image of Black Jack resting serenely in the depths. The calmness of the ocean and the tranquility of the village belie the fury of war that brought Deloach and his men to this distant outpost in faraway New Guinea. A handful of divers will visit the aircraft but this relic of a conflict long over sleeps peacefully… a testament to a gritty Air Force crew and the local village that reached out from another simpler existence and rescued them. I only met my uncle, Capt. Ralph Deloach, one time around February of 1979 on one of my rare visits to California. I recall that he was “Hollywood handsome” with flowing silver hair. He and my aunt spent half the year in Marina Del Ray, California, and the other half in England, living in an historic house complete with a thatch roof! Ralph presented himself as a staunch conservative Republican who was very much against the heavy taxes burdening the American taxpayer. I last heard that he had fallen into dementia some years ago. We also were impressed by the organization of the village, as well as the relatively stately “House of the Pilot” they built for Capt. De Loach for his visit. “Black Jack” is a great dive and this story brought it to life, with a lot of good background, for those who may never make it there. Thanks! I remember Capt. DeLoach as a cropduster at Steelestore, Texas, when I was a child. Great story. Just few days ago I was been on the “Black Jack” underwater with scuba unit with russian divers for article in underwater magazine. This is the KING – BOMBER. So huge! 48m depth. And few sharks arround. Thank you for the beautiful story and how you portrayed my village. The chief who organised the rescue of the Black Jack crew was my uncle, chief Paul Mogina and the man who recounted the story in the blackjack video was my father Cephas Mogina. The beaitiful village of Bogaboga is rapidly being eroded and washed away by sea level rise. Thanks for the great story! My uncle was Joseph Hart Moore, the co-pilot. I knew the story pretty well from his accounts of it over the years, although his retelling was less eloquent. He finshed the war as Major and received the Purple Heart and Silver Star medals. The one thing I remember from his recounting the story is that for a few days after the ditching he only had bananas to eat, and he never ate another banana in his life after that. He passed away in 1994. I’m proud of him and his service to his country, and if I ever take up diving (unlikely at 57) I’ll try to make my way to the wreck. Great story. You really brought this experience to life. Bret, I’ve enjoyed your writings over the years especially your take on the dive industry as a whole. I look forward to many more. Safe diving.